At various junctures in our lives we have – and will indubitably continue to – ponder our place in the universe. Have we achieved all that we possibly can? Have we done our very best with the faculties available to us? Should we have strived for more? And is there still time to make amends? This line of questioning inevitably leads to a variety of possibilities: impassioned declarations that never have any hope of transpiring; more realistic avowals that require grit and determination; the inadequate variety, easy to accomplish, but ultimately lame; or there’s complete surrender – accepting the things too hard to change, content to continue down a path leading nowhere, or otherwise, leap off that path through brutish means, into complete oblivion. When we meet Sullivan Moss in Debra Oswald’s Useful, he has reached this point, perched atop a rooftop, ready to jump, the asphalt below a fitting conclusion to a life lead poorly. Things do not proceed according to plan. 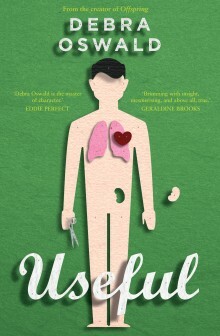 Useful is a sharp-edged but sweet-centred story about life, and the expectations we have of others as well as ourselves. Oswald utilizes a brilliant and quirky cast of characters, and has concocted a novel as emotionally resonant as it is glib. It doesn’t quite possess the same humour as Simsion’s Rosie books – although there are moments of hilarity – but it’s got just as much heart. A great feel-good read that has far more depth than readers might expect.